The latest asteroid hunting survey, the Panoramic Survey Telescope and Rapid Response System (Pan-STARRS, or PS1), has found its first potentially hazardous object. Asteroid 2010 ST3 is just 45 metres wide, and will fly past the Earth with 6.5 million kilometres to spare in just a couple of weeks time. It was discovered on 16 September when it was at a distance of 32 million kilometres, out of reach of other asteroid surveys. 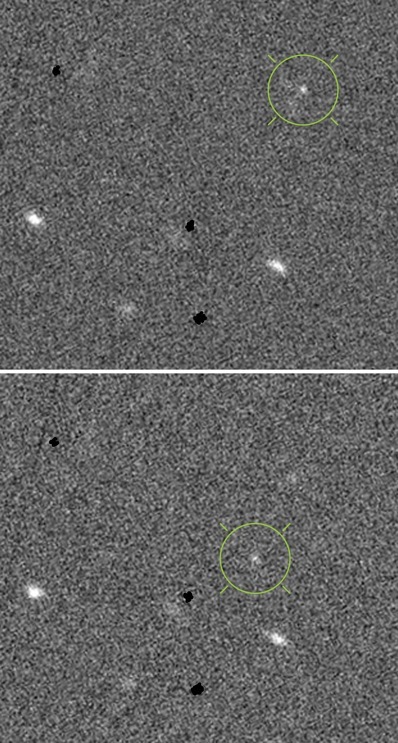 Two images of 2010 ST3 (circled in green) taken by PS1 about 15 minutes apart on the night of 16 September show the asteroid moving against the background field of stars and galaxies. Each image is about 100 arc seconds across. Image: PS1SC. Should 2010 ST3 strike the Earth it will likely explode in the atmosphere, but the resulting blast wave still has the power to cause devastation on a regional scale. The Tunguska event of 1908, which is believed to have resulted from a similarly sized object exploding a few kilometres from the Earth's surface, flattened an area of forest covering 2,000 square kilometres. Pan-STARRS PS1 Observatory just before sunrise on Haleakala, Maui. Image: Rob Ratkowski. All asteroids identified by Pan-STARRS that will come close to Earth within the next 50 years will be assigned the 'potentially hazardous object (PHO)' tag, and will be carefully monitored in order to calculate their precise orbits around the Sun. Should an asteroid have Earth in its sights, NASA scientists predict that with several years warning a mission to deflect the incoming asteroid could be implemented. Various strategies have been proposed, from deflecting the asteroid off course by focusing solar energy onto its surface to impart a change in momentum to its orbit, to 'gravitational tractors', whereby a constant thrust from an unmanned spacecraft might deflect the asteroid into a safe orbit. More dramatic proposals such as colliding a spacecraft with the asteroid might result in numerous dangerous fragments striking the Earth. 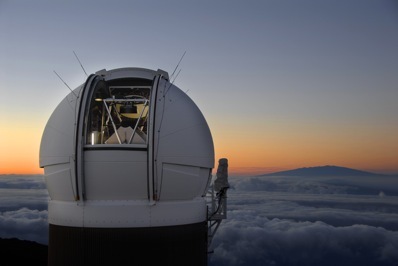 The 1.8 metre PS1 facility is based in Hawaii, and with its 1,400 megapixel camera it is expected to discover tens of thousands of asteroids every year. When its successor PS4 (which will have four times the power of PS1) begins operating later this decade, the duo may uncover as many as one million asteroids between them. The survey is also expected to catalogue five billion stars and 500 million galaxies, along with a new population of trans-Neptunian objects and comets.